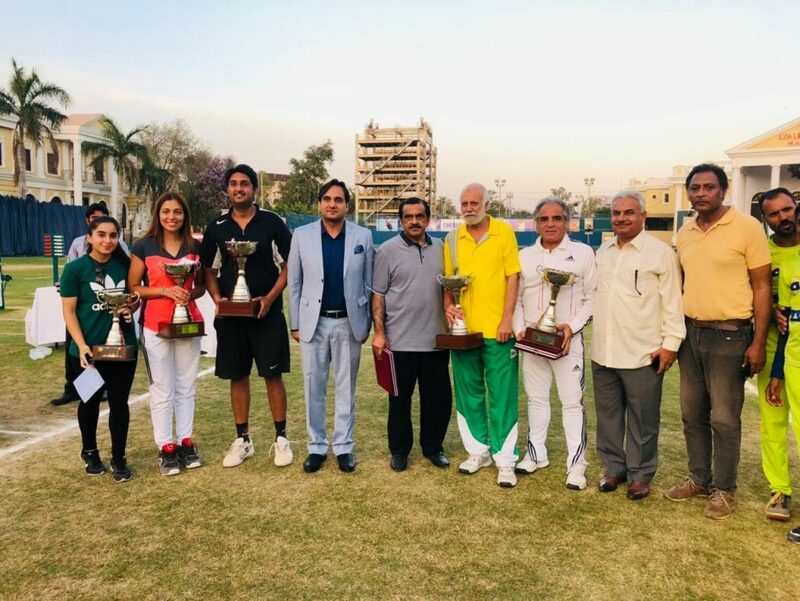 FAISALABAD: Shehzad Khan and Sarah Mehboob clinched the men’s singles and ladies singles titles in the 26th Governor’s Cup National Ranking Tennis Championship 2019, which concluded at Chenab Club, Faisalabad. In the Men’s singles final, Muzamil Murtaza, who outplayed top seed Aqeel Khan in the semifinals, was hot favourite to win the final but seasoned campaigner Shehzad Khan utilized his wide experience and skills to once again deprive spirited Murtaza of winning win the men’s singles title as Shehzad won the marathon final by 7-6, 2-6, 7-6. In the first set, Muzamil and Shehzad started very defensively and didn’t take in due risks. Both the players wisely focused to hold their service games till three-all. In the seventh game, Shehzad was down 15-40 on his serve, however, he managed to hold his serve, taking first serve edge by hitting a couple of aces and made it six-all. In the tie break, Shehzad succeeded to get mini break and at next point, Muzamil got the point at four points all. Again Shehzad broke service of Muzamil and took the next two points to win the first set 7-6. In the early stage of the second set, Muzamil broke Shehzad’ services and gained 4-1 lead. After this, only once Shehzad could hold his service game, which allowed Muzamil win the second set 6-2 and leveled the match at one-set all. In the final set, both the players successfully held their service games till six-all. In tie break, Shehzad played phenomenal tennis and won the set 7-6 to claim the men’s singles title. In Ladies singles final, both Sara(h)s were in action but this time, previous event’s runner-up Sarah Mehboob emerged as title winner as she overpowered leading ladies tennis player of the country Sara Mansoor in straight sets 6-2, 6-4. Sarah was in sublime form right from the beginning and never allowed her opponent to play freely, thus won the first 6-2. Sarah had to face tough resistance in the second set, where both the players played exceptionally and levelled the score at 4-all but Sarah once again showed aggression and succeeded in winning the game 6-4, thus grabbed the ladies singles title. Earlier in Men’s doubles final, Abid Ali Akbar and Ahmed Chaudhary outplayed Muzamil and Mudassir in three sets to win the title. In veteran over 55 years final, Rashid Malik (ZTBL) and Inam Ul Haq outsmarted Col Ijaz and Mian Usman by 6-2, 6-2 to claim the title. Malik and partner were in great form and just conceded two points to take the first set 6-2. They won the second set in the same way and same margin (6-2) to grab the title. Chief guest Sardar Saif Ullah Dogar, along with Chenab Club management/organizing committee, distributed cash prizes and trophies among the winners and runners-up. Also present on the occasion were PLTA Secretary, Rashid Malik and tournament referee Hamid Niaz.